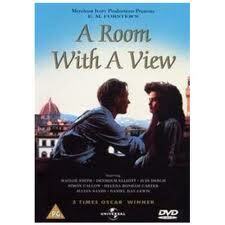 When the movie A Room with a View came out in 1985, I had never been to Italy. Within the first 20 minutes, I made up my mind to get there, especially to Florence and the countryside of Tuscany. That’s what movies can do for us. The story is from E.M. Forster’s 1908 novel of the same name; the chapter titles are charmingly used to name the chapters of the movie. In Britain, The Guardian named this movie one of the 10 best romantic films of all time, and it’s no wonder. Helena Bonham Carter, playing a somewhat muddled girl named Lucy Honeychurch, has to choose between two equally handsome men: Julian Sands, passionate and unconventional, and Daniel Day Lewis, bookish, inhibited, and full of himself. Maggie Smith, as her cousin and older chaperon Charlotte Bartlett, is deliciously dithery but finally comes down on the side of true love. Judy Dench, as a not-very-good lady novelist, writes some immortal prose about a scandalous kiss that takes place in a very real Tuscan meadow. Daniel Day Lewis, as Cecil Vyse, makes the mistake of mocking the passage at a crucial moment. (The very different movie My Beautiful Laundrette came out on the very same day as this one. It was hard to believe Daniel Day Lewis was the same actor in both of them. His incredible range as an actor put him well on the way to stardom). But I’ve given enough away already. Watch the movie! It’s available streaming on Netflix. The screenwriter, Ruth Prawer Jhabvala, won an Oscar for her screenplay. She won another Oscar six years later for Howard’s End, from another E. M. Forster novel. She collaborated for many years with the directing-producing team of James Ivory and Ismail Merchant. She died on April 3 of this year, at age 85. Throughout her life, she also wrote wonderful fiction. Her most recent story, “The Judge’s Will,” was just published in the March 25 issue of The New Yorker. Florence is not just a location, but a starring character in this movie. And the Tuscan countryside just outside the city is a place where dreams can come true. I did make it to Florence, and to the Tuscany countryside. Both destinations were everything I wished for, and more. Travel gives each of us a personal and lifelong “room with a view,” even after we return home. Movies can give us each a little boost in getting to those views. Join me next time for more reflections on the art and history of Europe! This entry was posted in Explore Europe, Films set in Florence, Florence, Italy and tagged A Room with a View, Daniel Day Lewis, E.M.Forster, Florence, Helena Bonham Carter, Judy Dench, Julian Sands, Maggie Smith, Tuscany on April 14, 2013 by Claudia Suzan Carley.